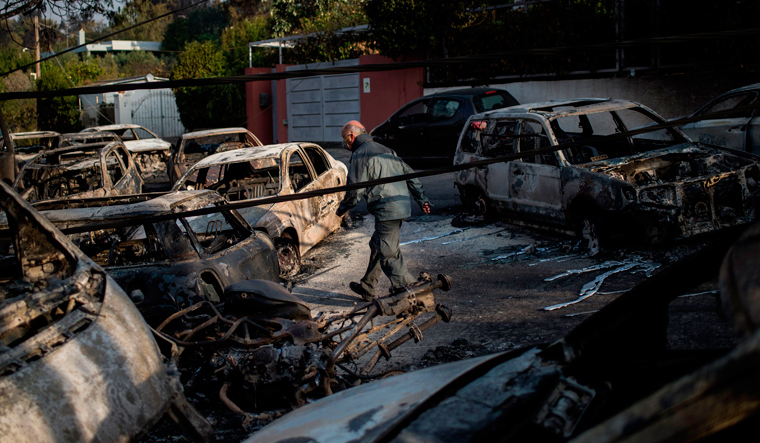 Greece’s prime minister told of the “unspeakable tragedy” the country faced after at least 74 people were killed by wildfires that swept through a resort, trapping people in cars and on the edge of cliffs as others were forced to jump off to survive. The scale of Monday night’s devastation in Mati became apparent at first light on Tuesday. Scores of gutted cars lined streets in the coastal town, east of Athens, melted by the intensity of the heat. Bodies lay on roadsides, and in one area, a group of 26 people were found dead - some locked in an embrace as the flames closed in. The group, which included children, were found near the top of a cliff overlooking a beach. They had ended up there after apparently searching for an escape route. “Instinctively, seeing the end nearing, they embraced,” the head of Greece’s Red Cross, Nikos Economopoulos, told Skai TV. The lucky ones were able to leap off the cliffs to survive, or rush into the sea from the beach. “We went into the sea because the flames were chasing us all the way to the water. It burned our backs and we dived into the water,” said Kostas Laganos, a middle-aged survivor. At least 74 people were killed, a fire brigade spokeswoman said, and the death toll was expected to rise. Poland said two of its citizens, a mother and her son, were among the victims. It was not clear how many people remained unaccounted for as boats combed beaches for any remaining survivors. Residents, their faces blackened by smoke, wandered the streets, some searching for their burned-out cars, others for their pets. The eerie silence was punctured by fire-fighting helicopters and the murmur of rescue crews. There were yellow body bags in several areas. Many in the area had been unable to escape the fast pace of the blaze even though they were a few metres from the Aegean Sea or in their homes, the fire service said. A Reuters photographer saw at least four dead people on a narrow road clogged with cars heading to a beach. One of the youngest victims was believed to be a six-month-old baby who died of smoke inhalation. At least 187 people were injured, officials said, among those 23 children. “Greece is going through an unspeakable tragedy,” Prime Minister Alexis Tsipras said as he appeared on television to declare three days of national mourning. Flags atop the ancient Acropolis hill and parliament flew at half mast. The inferno was thought to be Greece’s deadliest, with the death toll higher than fires which ravaged the southern Peloponnese peninsula over several days in August 2007, killing dozens. By Tuesday afternoon, the Mati fire was contained, but the risk remained of it reigniting in scrubland parched by Greece’s searing summer heat. Wildfires are not uncommon in Greece, and a relatively dry winter and hot summer helped create the current tinder-box conditions. The cause of the current blaze was not immediately clear and an Athens prosecutor ordered an investigation into it. Mati is a popular spot for Greek holidaymakers, particularly pensioners and children at summer camps. One of the missing included a woman with multiple sclerosis, dragged out of her wheelchair by her frantic husband as the flames closed in, but lost in the ensuing chaos. The fire service urged residents to report missing relatives and friends. Some took to Twitter and Facebook, posting photographs of young children and elderly couples they hoped to track down. Greece issued an urgent appeal for help to tackle fires that raged out of control in several places across the country, destroying homes and disrupting major transport links. Newspapers printed banner headlines including “Killer Fire” and “Hell”. Cyprus, Spain, Italy, Croatia and Portugal offered assistance after Greece said it needed air and land assets from European Union partners. “Our thoughts go to Greece and the victims of the terrible fires,” French President Emmanuel Macron said in tweets published in French and Greek. Pope Francis said in a telegram he was deeply saddened by the tragedy and prayed for the victims and their families. Lok Sabha 2019 elections: If not Modi as PM, then who?